Get all 3 books in C.J. 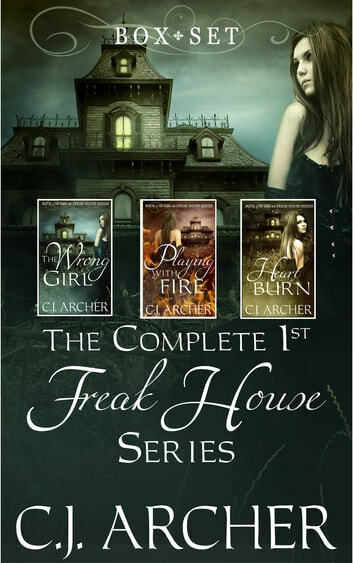 Archer's THE 1ST FREAK HOUSE TRILOGY in a single volume for one low price. Each book in this boxed set is available for purchase separately, but by buying them in this bundle, you're getting a better deal! Excellent read. Well written and easy to follow with lots of unexpected twists. Have really enjoyed this series. Looking forward to reading the next one. This story kept me interested for weeks. I was sad when it was over. It is a good thing there is a 2nd trilogy. Very entertaining, story flows well. The characters are captivating, and the setting is very well researched, lending a believable tone to the story. A well constructed series of supernatural romance with a feisty heroine and a handsome hero plus some complex and interesting supporting characters. A good read. Smashed this trilogy out a book a day till it was done. Couldn’t put it down - sorry to my poor customers, despite the hold music saying ‘your call is important to us’, this story was far, far more important. My only complaint was when it ended, but I then discovered there’s not only a second trilogy, but also a third! Goodbye weekend. Hello to more Freak House! !